After roaming the desert Southwest for thousands of years, the Mexican gray wolf was, almost in the blink of an eye, driven to the brink of extinction. 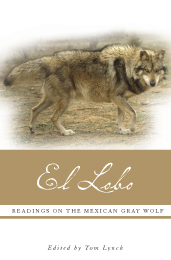 El Lobo collects writings that explore how this subspecies of wolf was brought so close to the edge of annihilation. The first section, 'To the Brink,' includes essays that describe wolf biology, the campaign to exterminate wolves from the Southwest, and the wolf’s role in Native American cultures and in Mexican folklore. The second section, 'And Back,' illustrates a turnaround in attitudes and policy and includes Aldo Leopold’s famous essay 'Thinking Like a Mountain,' Rick Bass’s astute analysis of the political divide, and Sharman Apt Russell’s carefully woven plea in which she shares her experience with Pueblo Indian children meeting a wolf in their school auditorium. These essays, from both sides of the contested issue, resonate with passion, conviction, and the desire to save a world that is mightily at risk. Tom Lynch is assistant professor of English at the University of Nebraska, Lincoln. He has published widely on subjects ranging from ecocriticism to Australian nature writing. "By the end of the book, a reader who started not knowing much about wolves in general or wolf reintroduction programs is educated scientifically, historically, and emotionally."